Before I get into this week’s post…I want to bring you back to the Samoas Ice Cream Pie – remember that one? As luck would have it, I managed to make it as a finalist in the Girl Scout Cookie Recipe Contest!! HORAAY!!! That means I NEED YOUR HELP. The winner with the most votes wins the contest – you can help me out here. You only have until February 27th at 10pm to vote. One vote per person, so tell your friends! Now if I win, I am going to donate the money to charity. Which charity? Well, that’s where you come in! Please leave a comment with your favorite charity, and if I win, I will randomly select one. Oh, and one more thing – cookies go on sale Monday, February 27th and last until March 15th. So you have a few weeks to stock up on those cookies – particularly the Samoas, so you can make that Ice Cream Pie! Remember, it is Samoas 40th Birthday!! I know what you are thinking…what are those pumpkins doing in this post? Well, I am behind…more than just a little. I still haven’t even made the neighbors their special holiday treats…hopefully I will catch up soon. I am just dealing with a lot these days. 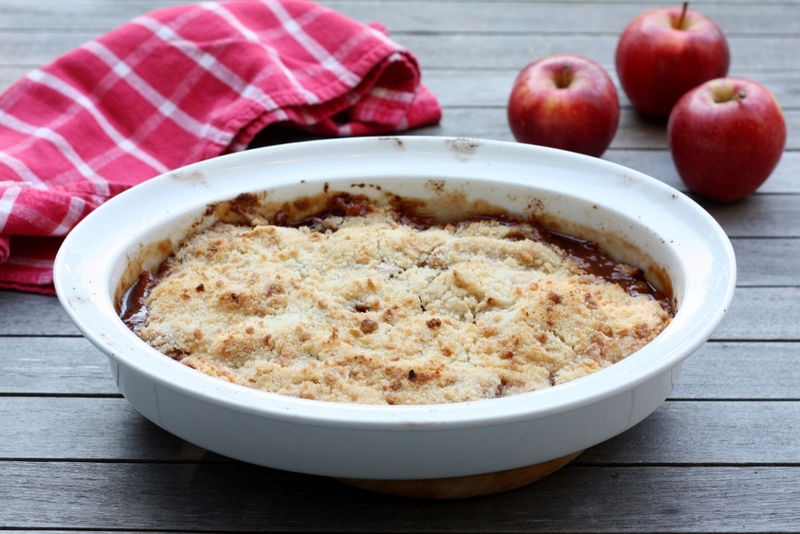 So what does this amazing looking Apple Cobbler have to do with the Samoas Ice Cream Pie? The crust!! In the Samoas Ice Cream Pie, the ice cream was something else – but it was nothing compared to that crust. Well, here we go again, except that this time the ratio of crust to filling is about 1:1. You don’t get that very often. But this cobbler is all about the crust – my grandmother definitely knew what she was doing here – but then again, when did she not when it came to desserts? Remember, I used her fudge recipe for the pie as well. Make the topping – combine the flour, baking powder and sugar. Add the butter in 1 tablespoon chunks, and mix with your fingers until it looks like course meal. Add the vanilla, bourbon and vinegar and gather up into a ball using plastic wrap – then throw against the counter until it is all combined well. Chill for about 2 hours. Mix the apples with the rest of the ingredients. Grease an 7X11 glass baking dish. Add apple mixture. Remove topping from the refrigerator, and break into small chunks all over the apple filling. Brush with the milk, then sprinkle with sugar. Bake in a 375 preheated oven for 10 minutes, then reduce the temperature to 350 and cook until bubble and the topping is golden, about 20-30 minutes more. My husband has really been trying to stay away from dairy, and I have been encouraging it. It is pretty easy to cook without dairy – and if I am making something with cheese, I just put cheese on part of it. Therefore everyone is happy. Baking is a different story though, and I am slowly learning what I can use to substitute with. Milk and buttermilk is pretty easy – I can almost always use coconut milk, and the final product actually tastes even better – butter is a different story though. My neighbors brought us a bunch of apples from their trees on the peninsula – and they were calling me to bake something with. I instantly thought of a crisp – and I had to make it dairy free. I found this simple recipe on Bon Appetit online but was on a quest. I found these earth balance sticks – and decided to give it a try. They are not a great substitute for butter when making a cake – oil is much better for that, but I thought for a crisp they might just do the trick. I was right – this crisp was amazing. I shared it with my neighbors, and everyone agreed. You would never have known that this was made without butter. The topping was extremely simple – and gave it a nice sweet crisp bite – if you want, you could definitely add some oats for additional texture but I didn’t think it needed it. OK – 8 days left in October and I am going to make the most of it…stay tuned! Preheat oven to 450°F. Butter 13x9x2-inch glass baking dish. Combine brown sugar and cinnamon in large bowl. Add apples and lemon juice, and toss to coat. Transfer apple mixture to prepared dish. Combine flour, 1 cup sugar and Earth Balance in a medium bowl. Using pastry blender or fingertips, blend ingredients until coarse meal forms. Spread flour mixture evenly over apples. Bake crisp 20 minutes. Reduce oven temperature to 350°F. 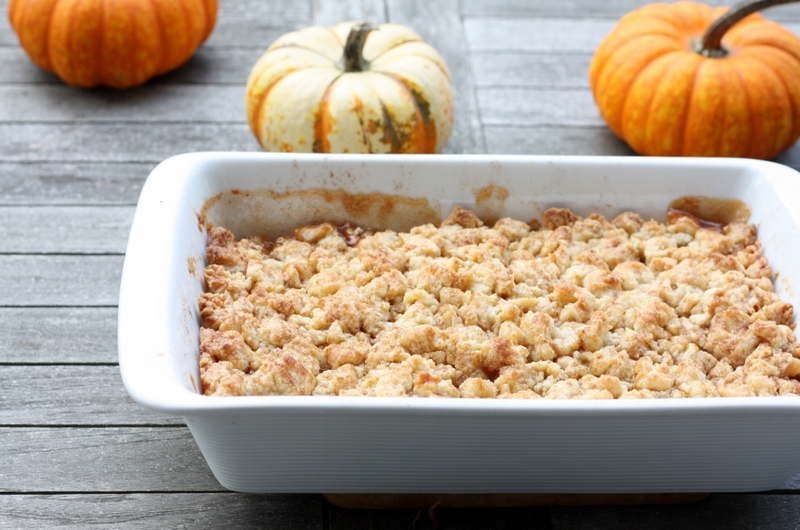 Bake crisp until apples are tender and topping is golden brown, about 30 minutes. Let stand 15 minutes before serving. My family goes a little nuts over mango. Ok, yes, I have my own obsessions that are slight oddly: fennel, cucumbers in cocktails, cream cheese frosting – but mango? Definitely not one of my must haves in life. I actually love the flavor of mango – I just hate cutting them up. I hate that strangely shaped pit – and I also hate it when you cut the mango too close to the pit, and the mango gets a little fibrous – almost hairy. For a while I was getting mango in our CSA basket, and I dreaded the day I actually had to slice them open. I swear my girls (even my husband) would circle like vultures, trying to get as much mango as they possibly could – making it almost a competition between the three of them. I always had to tell them to go sit down and let me slice in peace – the last thing I wanted was to slice one of their hands instead. I finally stopped getting them, it was getting too dangerous. 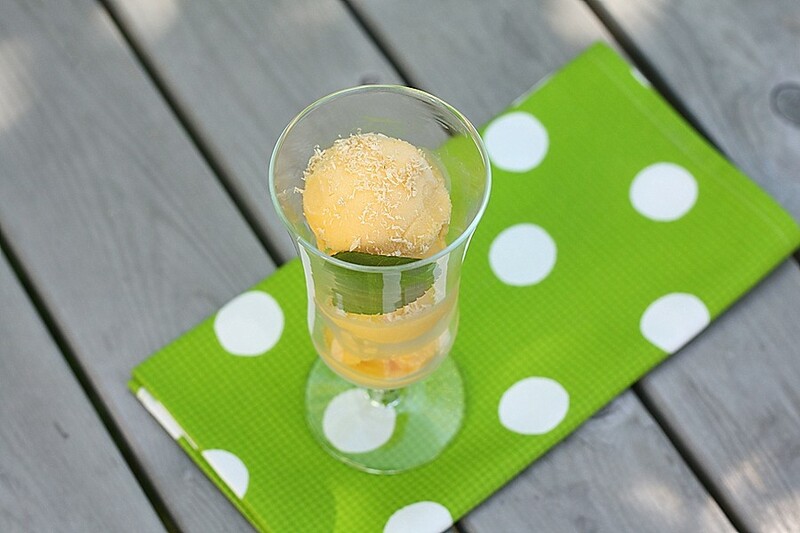 I saw this recipe in Cooking Light, and I have to say, I do love a good mango sorbet. The fact that this had coconut milk in it made it that much more interesting to me. I pretty much love anything with coconut milk – yes, I guess another one of my obsessions. I had to buy some mango to make this, but I told my family that these were off-limits. They waited patiently all week for them to get ripe, and for me to make the sherbet. Well, I think it was worth the wait – this was pretty spectacular. I swear I could have just stopped before putting the mixture in the ice-cream machine – it was so smooth and delicious – tasted just like a mango smoothie – but the final product was excellent. I served it two ways – with shredded coconut on top, and with grated lime peel. Both were delicious. If you are looking for a light dessert this summer, definitely mark this one down. If I ever happen to have some spare mango lying around, I know exactly what to do with it – right, who am I kidding? Combine cubed mango, sugar, 1 tablespoon lime juice, and coconut milk in a blender; process until mixture is smooth, scraping sides as necessary. Pour mixture into the freezer can of an ice-cream freezer, and freeze according to manufacturer’s instructions to soft-serve consistency. Spoon sherbet into a freezer-safe container; cover and freeze 2 hours or until firm. Sprinkle each serving with coconut. Well, the peaches were all ripe at the same time – way too many to just eat – so it gave me a perfect excuse to make this recipe I found in Cooking Light. I love oatmeal cookies – and combined with sweet, delicious peaches, what could be better? I have to say, it is so much fun to cut and peel peaches that are ripe – and so not fun to cut and peel peaches that are not ripe. I love cutting around the pit, twisting the two halves around in opposite directions, and watching the pit just fall out. Ok, usually I have to twist the pit once the two halves are disconnected, but when they are really ripe, the pit just comes right out. Next comes the best part – peeling. I always play a little game – I win if I can remove the skin in one intact piece. I’m not sure what the prize is other than it being really quick and easy. I love the look of that naked peach without it’s skin. At this point, I have to stop myself from just eating it – because it looks so good. Ripe peaches, the best. This cobbler was outstanding. The crust was slightly crispy on the outside, but tender and chewy right below – and the peaches were a perfect complement for the peach filling. There was lots of oatmeal cookie with every bite of fruit. 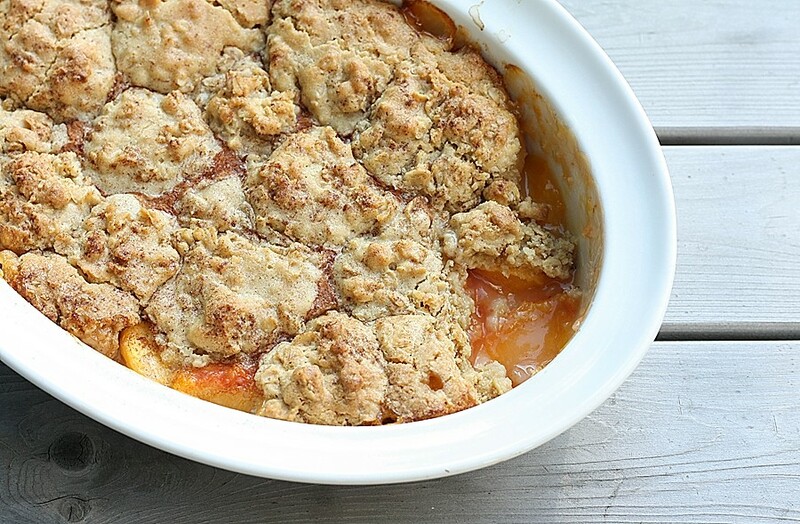 If you are staring at a bunch of ripe peaches, get to work – you will not be disappointed. To prepare topping, place first 3 ingredients in a large bowl; beat with a mixer at medium speed until light and fluffy. Add vanilla and egg; beat well. Weigh or lightly spoon 1 cup flour into a dry measuring cup; level with a knife. Combine 1 cup flour, oats, baking powder, and salt; stir with a whisk. Add flour mixture to sugar mixture; beat at low speed until blended. Cover and chill 30 minutes. To prepare filling, combine sliced peeled peaches, 1/3 cup granulated sugar, 2 tablespoons flour, and fresh lemon juice in a bowl; toss to coat. 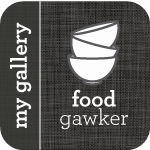 Spoon mixture into a 13 x 9–inch baking dish coated with cooking spray. Dollop 12 mounds of chilled dough over peach mixture at even intervals. Bake at 350° for 40 minutes or until lightly browned and bubbly.